Shadows of Combat is a book of poetry dealing with one of America’s most turbulent times in modern history – the Vietnam era. 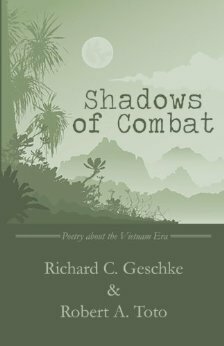 Richard Geschke and Robert Toto, two citizen soldiers, are poets and writers, who used their talents to write about all that they went through in the U.S. military in the late 1960’s to the early 1970’s. Through their powerful and moving verse, the reader gets a heartbreaking and meaningful glimpse into a bygone era. Everything is put into historical context, with the two men first coming to train at Fort Benning in Columbus, Georgia, then going on to jungle warfare school in Panama, then to “The Zone” in West Berlin, and ultimately to Vietnam. In his preface Toto writes how poetry helped him uncover suppressed emotions from his time in the military: “Some of it was soul searching, some of it was surreal, some of it was therapy.” Clearly Geschke and Toto derived inspiration from this great time of unrest and intolerance.Very aptly, the first poem is “Follow Me!” – the motto of the infantry school in Fort Benning, where it all began and where the two authors met and became “joined at the hip”. Geschke writes:“…home of the infantrywhere in front of the infantry schoolstands the statue of a leaderwho raises his arm forwardurging his men to “follow me!”And that’s precisely what Geschke and Toto did, they followed the “leader” and all the way to Vietnam. The poems of Da Nang are very vivid and leave you with a gut-wrenching impact: “My God, every night there were rocket attacks!... Such was life in Da Nang.”But the book is not just about the horrors of war, it is also about honor, camaraderie, pride in one’s country, loneliness. It is very easy for the reader to connect with all the events, which not only move the imagination but stir up all kinds of emotions.In the end, however, the authors, like so many others, find themselves questioning the war’s purpose and the politics behind it. The war that changed a generation also left that generation wondering what it was all about: “Most of them never served,but had no problem sending millionsto serve in a long and senseless war.”The Vietnam War was a very unpopular war. Perhaps the most difficult thing for the soldiers, even more difficult than serving in Vietnam, was coming home. The psychic aftermath was profound and the words in “Tattoo” are chilling:“There were millions of us,who went there,but coming homeit was only one man facingthe indifference of people back home. Each of us facing it alone, total isolation!”Shadows of Combat is a poetic reaction to war and Geschke and Toto lived their poems. They are not only very moving and accessible but leave the reader with a better understanding of the human experiences of the Vietnam era. The voices of Geschke and Toto are real, sometimes grim, sometimes haunting, and sometimes even hopeful. The impact they leave is a deep and enduring one. Shadows of Combat would make an excellent text for classroom use.